Lord, we woke this morning to another wave of sorrow. More of us are dead. We had to tell our children, once again, of the evil we’ve done. We have to face another grieving day, added on top of all the other grieving days. We have tears. We have anger. We are hellbent on destroying one another. You’re going to have to help us see the truth. You’re going to have to give us courage to be something different. You’re going to have to help us. Amen. I wonder, when we’re praying our Advent prayer (Come, Lord Jesus) if we have any idea what we’re meddling with, if we have any sense of the power we’re invoking. I pray this prayer, and I think I mostly believe it. I cling to this hope because I can not escape the sense that our world writhes in convulsions, and I am unable to imagine any solution we humans could muster to ultimately fix the mess we’ve made. During Advent, we utter an honest confession: We are full of good intentions but weak at keeping promises; our only hope of doing God’s will is that You should come and help us do it… Painful as they are, these words ring true. And yet, when we ask God to come, to act, we are not tinkering with some plaything we can maneuver to our own bidding. We’re dealing with the God who burns, the God who holds the world together, the Holy One. I hear the quake in the prophet Malachi’s voice: Indeed, God is coming. But who can endure the day of his coming and who can stand when he appears? Malachi continues: And don’t be so foolish as to think that when God’s justice lands, it only lands on those you think deserve it. We’re all in trouble, and we’ll all be healed together. We all need to be reborn. We all have to go through the fire. I wonder if we pray our prayers for justice too easily, aimed at everyone other than ourselves? God is the God of endless generosity, boundless joy and unfettered delight – I believe this. I also believe that the God powerful enough to make such things true (the God strong enough to heal all wounds and silence all oppressors) exudes a furious love. A love that is for us. A love that will not let us go. A love that will not leave us to our own devices or abandon us to wallow in our narcissistic stories. We long for God to come, as we should – this is our hope. But this is risky business. This is a trembling sort of hope. Over the past year, Miska has given our bedroom a complete makeover. First, Miska pulled out the paintbrushes, and when she told me she covered our walls with a shade called Silver Fox, I smiled. I imagined the voice of Barry White: Silver Fox, Oh yeah… Next we said goodbye to heavy furniture, replaced with small, simple pieces. We cleaned out bags of clothes, magazines, books and the trinkets you collect over 18 years and find stashed in the corners of drawers awaiting such a day as this. My favorite touch, however, was when Miska gave both of us a new bedside table. I only wanted three things on mine: a lamp for reading, prayer beads a friend made for me and a small icon of the Good Shepherd. 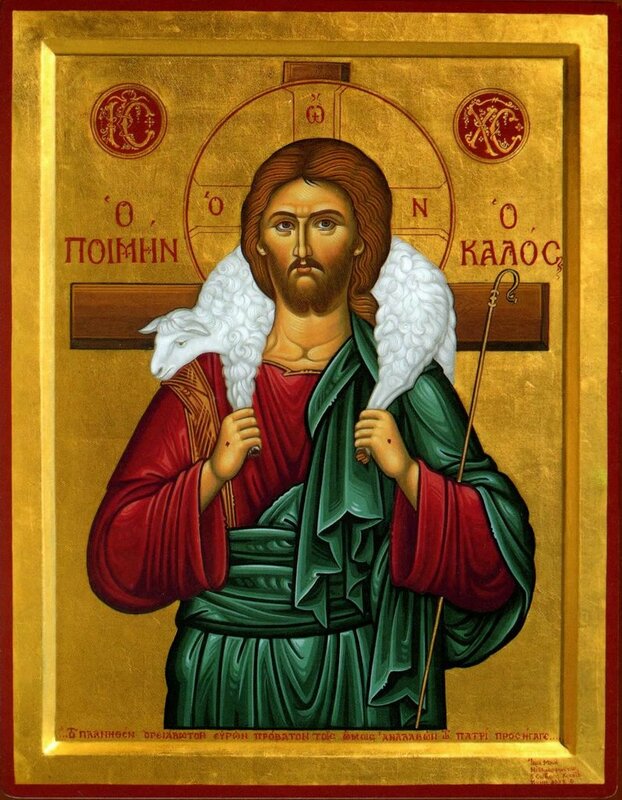 Jesus said, “I am the good shepherd,” and the image shows Jesus carrying this weak creature with gentleness and strength. I’m drawn to the firmness in Jesus’ eyes, as if Jesus’ says, This is my sheep, just try to come and take ’em. Scripture tells us that the Shepherd lays down his life for the sheep, that the Shepherd knows all his sheep and will never forget them. The Shepherd, Scripture says, will even leave the 99 of his flock to roam into the wild night and find that one sheep that has lost her way. Sometimes this world, though chock full of beauty and goodness, can be a disturbing, perplexing place. What will come of us? What should we do? Will we know the right decisions to make? Will the woman next to me and the two boys snoozing a few feet away be alright, and will they live well – can I protect them? What will come of us? Will we have years ahead to love and enjoy one another, or will it all crash down, as it does for so many? Will all those friends and strangers who face ruin and despair be okay? What are we to do with all of the uncertainty? What are we to do with this one life we’re given? Why does our life sometimes feel so tenuous? Perhaps as evening ebbs, I feel the futility of trying to grip the hours, of trying to grip my life. Perhaps I feel more vulnerable here, embracing the loneliness appropriate to moons and midnights. Perhaps this is why I wanted the Good Shepherd close, watching over me and those I love in our sleep. I cannot stay awake, but the Shepherd does. I cannot hold the world on my shoulders, but the Shepherd does. So each night now, before I put down the book and click off the light, I look into the eyes of the Good Shepherd, and I say Thank you. Levi, now in his eighties, held his words with wonder and frugality, the same way he took care with those rare shiny nickels when he was a boy. There were never more than a few in his pocket, and he surrendered them only with great care. And since Levi prayed the same as he lived, Levi’s prayers were short and direct, never more than three or four sentences. Levi might express bewilderment “at the meanness of things” or ask God to grant kindness to Margie or Duke or the Simpson family as they faced their troubles; but whatever sentence or two might populate the meat of his daily petition, Levi always concluded with exactly the same affirmation: And God, we thank you for the bounty. Amen. Bounty was a word out of favor, but Levi clung to it. It was not that Levi viewed the world through a rosy tint. God knows he’d lived through more than one man’s share of sorrows. Rather, Levi believed grace was abundant, that grace would surprise you with its persistence. Levi could not agree with modern sentiments grounded in fear, scarcity and exclusion. There was always enough faith, enough hope, enough love – even if some folks misappropriated God’s name and muddled these truths. Levi assumed that his one-line prayer would do little to alter the stampede of popular opinion, that his prayer was likely only a protest in vain. Levi figured all this was not his concern, that God was more than salty enough to handle his own affairs. So Levi simply kept on. Levi considered this his duty, to speak this one word every day of his life: Bounty. Well, alright. Here we are again. Another morning to wake, God. Another horizon of possibilities, treacheries, love and, to be sure, a little sadness. We never know what a day holds, but usually there’s a bit of each of these in the mix. If possible, Lord, double down on the joy and laughter. I’d appreciate that. I’ve noticed how a lot of folks have been doing a lot of crazy stuff in your name lately. I guess that’s nothing new for you. I know I’ve contributed to this myself. I do wonder, though, if this weighs heavy on you. I know you carry the weight of the world, but you also carry the weight of our foolishness. I’m sure thankful, but I am sorry. I’m sorry. There’s one thing I believe, and I’m pretty certain I learned it from you: Love holds us together. All of us. I forget this, but I want to remember. Will you help me remember? It really does change everything. Alright, we’ve got to get to it now. The day’s calling us. I’ll be watching for Love today, watching for you. The first time I saw her, I did not know whether she was an angel or simply disturbed. With silver hair shimmering down her back, past her waist, I could not miss her form even given the distance. I know every inch of this sidewalk, these blocks, the feet and the faces that frequent this route with me, but she was new. The tiny courtyard where she stood, back turned to me, is the lone and final outpost where those from the institutional home can go for smokes. It’s a sad concrete island, with one small bench, where smoke from the mufflers mixes with the nicotine. The silver-haired woman did not sit, and she did not smoke. She raised her hands, shoulder-high and palms up. The outcast island transfigured into a sanctuary. One quiet person in one loud space can transform ugly into beauty, isolation into presence, endings into beginnings. As I jogged closer, she turned toward the street, and I could see her face turned upward. She had a gentle, expectant smile. A smile of contentment, of revelation. She opened herself to the sun. Her eyes were closed, but she drank the sunlight. The warmth washed over her open hands, like water poured from a basin. And her lips mumbled words – or were they trembling? The woman with silver hair stood in the bright, her countenance shining. She prayed into the light as an SUV and a Prius and one curious jogger passed. The next morning, the scene repeated. Only this time, the shimmering woman stood outside the front door, atop the rickety stairs. She stood straight, a pillar. Her eyes closed and face upward toward the warm beams, hands hung by her side. The same radiance, the same settled, knowing smile. Cars whizzed, honks, a man walking in front of the fire station across the street yelled to a friend in a sedan. I jogged past. She did not move. She was in tune with something beneath it all, over us all. I do not know if the shimmering woman is an angel, but if she is disturbed, one could do worse than being a bit disturbed. Last Wednesday was one of my days to be at the University of Virginia, and I parked on the opposite side of Grounds from where I typically park (it’s Grounds here, not campus. We’re persnickety about these things). My return route to my unusual parking spot meant that I walked past the 24 hour Dunkin’ Donuts. In general, Dunkin’ is not an establishment I frequent. On any normal day, I’d stride by without a thought. However, inspiration hit, and I thought I could score dad-of-the-year points by surprising the family with after dinner treats. I popped into the shop and walked out with a bag carrying 2 chocolate covered donuts with sprinkles, 2 blueberry donuts and one reduced fat blueberry muffin. To review: I parked in a spot I never park on Wednesdays which meant I walked a route I never walk on Wednesdays which meant I strolled past the donut shop that I never enter on a day that I shouldn’t have even been near. Yet there I was holding a bag of donuts that never should have been. Got it? Can you imagine the shock on his face (and mine) when, seconds later, I walked into the kitchen carrying the bag I was not supposed to have? I do not care to turn this story hokey by making some appeal to providence. Sometimes, donuts just happen. I will say that I may or may not have grabbed the phone after everyone was in bed and secretively asked Siri for a best-selling novel and for Clemson to win a National Championship. Dumbfounded by this moment, however, I’ve found myself struck by the gospel reading and the prayer the lectionary offers us this week. John’s gospel reminds us that after his resurrection, Jesus cooked fish over the charcoal fire for his friends. Then, in a reprise of their Last Supper, Jesus broke bread for them and fed them. There are many powerful ways Jesus could have chosen to share himself, and yet, as the prayer says, he chose to reveal himself in the breaking of bread. Jesus gave us bread that nourishes the body and heals the hunger — and this was not bread whole but bread broken. I know many people in my sphere who are desperate for love today, desperate to be full, desperate for wholeness and healing. Gandhi said that some people are so hungry that God can only come to them as bread. The good news is that if bread (or love or joy or belonging or hope or friendship – or even donuts, I guess) is what you need, then God in Christ comes to you as exactly that. I pray you will find your bread today, and I pray you will eat to your heart’s and to your belly’s content. Prayer and Play. And Treehouses. Two Christmases ago, Miska gave me a splendid coffee table book, New Treehouses of the World. 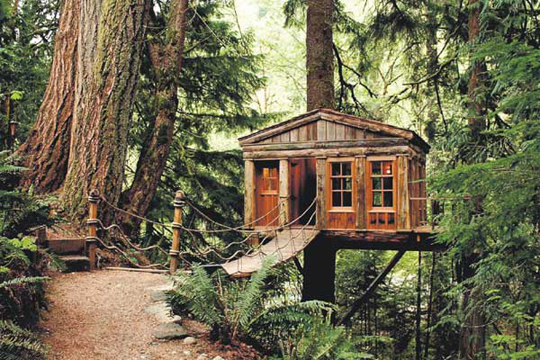 I have never owned a treehouse, but my cousin Tim and a few of his pals built a magnificent tree fort that I envied as a child. Tim was a few years ahead of me, and the fort was in disrepair by the time I was old enough to have been able to enjoy it. However, in seminary, I stayed with my aunt and uncle several nights a week, and each day on my way home from class, I’d pass that rotted-out beauty and pine for what might have been. The book sat on my dresser for an entire year unopened until last December when I was packing for two days at Holy Cross Abbey, a Trappist monastery where I planned to retreat. I was exhausted and in much need of a spiritual infusion. On a whim, I tossed the bulky Treehouses into my backpack. I had not opened the book in the entire year prior, and this beefy hardback was not the sort of book you take on travels. Nor was it the sort of spiritual tome one would normally consider part of the reading list during days with the Trappists. Yet there it was in my North Face pack, and I couldn’t possibly tell you why. On the drive north, I began to think of what God might have for me during my time, and the word that repeatedly returned to me was play. This was not the word I would have picked, which is at least half a reason for thinking it’s something to pay attention to. I pulled into the parking space for the retreat house, aware that the crisp air and the tree’s brittle branches matched the tone of my soul. When I stretched out of the car, an old, very fuzzy grey cat slowly strolled my way. The cat, acting as guestmaster, purred a hello, turned to point me toward the front entrance and then, having done his duty, slowly patted away. I’m not one to pause for a cat, but I stood there for a moment chuckling. The greeting struck me as magnificently playful. That evening, I laid on the twin bed in my monastic cell; and though I had planned to spend time in focused, contemplative prayer, my brain had all the perkiness of cold molasses syrup. I opened a book of Thomas Merton’s spiritual letters to read, followed by a volume of poetry and a couple theological works. I thumbed several pages of each, but they all made me weary. Run out of options, I pulled out the treehouse book and into the wee hours of the night, I gobbled up pictures of play spaces from around the world. I remembered my boyhood fantasies and my love of rugged spaces. I considered what it would be like to craft one of these tree abodes, hopefully building it with my sons. In that little cell, I played. St. Gregory of Nazianzus, that theologically prolific fourth-century bishop, reminded us that “man is the play of God.” God’s high creation, his own image, came as an act of play, of joy and delight and imagination run wild. When our theology is so serious and our discipline so stringent that we no longer have hearts at play, then we have massively missed the point. Prayer and play, these are two ways of talking about the same thing.